A Book About Death, Wales. Sonja Benskin Mesher RCA UA, Wales, curator. It happens all our lives. It happened in 2006, and struggling, drew on the small things. The call for work for the original Book about Death via Matthew Rose came in 2008. Thinking I had nothing, put it aside. 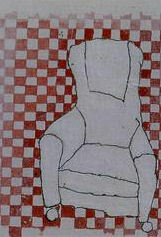 Quietly the involvement started, submitting a piece, ‘the empty chair’. Carried on with work, to find the project became phenomena; I am now involved to curate, compile Wales’ unbound book, and become humbled by others’ work and stories. Wales first showed ABAD, as it is known fondly known by participants, at MOMA in Macynlleth in 2010. This year The Royal Cambrian Academy, Conwy, Wales has agreed to host the next chapter in September 2014. I can tell you long and hard the logistics, put simply the phenomena lives and grows through death, the arts, the internet, through friends. Ray Johnson, Matthew Rose, figureheads, as we prepare for ABAD’s 29th exhibition. Love the idea…Death is so scary until finally it is there in your face and then you have no choice but to greet it….